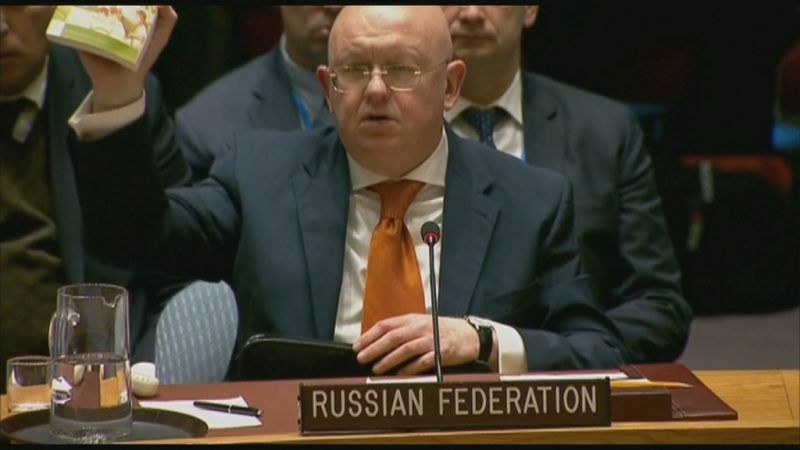 Russian Ambassador to the UN Vassily Nebenzia speaks at a Security Council meeting on the spy attack: The evidence @theresa_may provided is an absolute travesty, the polemics of these six pages are an insult to your intelligence. London blames Russia but the Kremlin denies any involvement. Britain says the poisoning was carried out with a military-grade nerve agent developed by the Soviet Union. “This is all using the method of Dr Goebbels,” he added in reference to Nazi Germany’s propaganda chief. Russia requested the UN Security Council meeting on Wednesday, the same day that Moscow failed in its bid to join a probe into the Salisbury incident by global chemical watchdog, the Organisation for the Prohibition of Chemical Weapons. 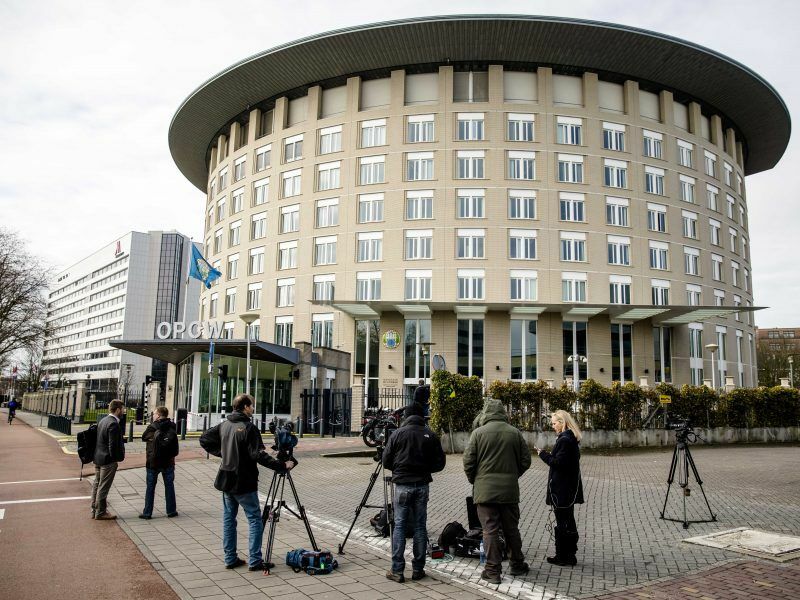 Russia lost a bid yesterday (4 April) at the global chemical weapons watchdog to launch a joint probe with Britain into the spy poisoning scandal, and sought to press its case at the highest level, calling for urgent UN Security Council talks. In response, British Ambassador Karen Pierce said London had conveyed Russia’s demand for consular access to the spy’s daughter Yulia Skripal and that the British government had acted entirely properly within international convention. “It’s yet another attempt by Russia to use this Security Council for political gains,” said US diplomat Kelley Currie. “This is not a tactic that is appropriate for this body,” she said of the Goebbels reference. He then mused on the whereabouts of reported Skripal pets, two cats and two guinea pigs. “What happened to these animals? Why doesn’t anyone mention them? Their condition is also an important piece of evidence,” he said. A British government spokeswoman told AFP late Thursday that both guinea pigs had died and that a cat found in a distressed state was euthanized. She did not mention a second cat. Nebenzia also reached for a copy of “Alice in Wonderland” and read aloud an extract about the white rabbit. “It suits Russia to turn the whole business into a farce. By playing up the melodrama at the UN, Nebenzia succeeds in distracting from the seriousness of the crime,” Richard Gowan, a UN expert at the European Council on Foreign Relations, told AFP. “By turning it into a game, Russia aims to make the UK look a bit silly. A lot of other countries might like to let the matter drop before it worsens relations with Russia further, so Moscow’s strategy may not be a joke,” he added. But even before the meeting, the British ambassador kicked off the literary allusions by taking aim at her Russian counterpart’s purported fondness for a Sherlock Holmes analogy. Allowing Russians scientists “into an investigation where they are the most likely perpetrators of the crime… would be like Scotland Yard inviting in Professor Moriarty,” she told reporters of Arthur Conan Doyle’s fictional criminal mastermind. Sergei Skripal, a former double agent – was in a Russian jail serving 18 years for spying – he came to the UK on the basis of a spy swap if the Russians disliked him that much they had plenty of opportunity to kill him…. in a Russian jail. The formula for the binary nerve agent is available in a book which can be bought via Amazon. The two components that form the agent can be purchased in Europe and other places that have functioning pesticide and fertiliser industries. The problem is not getting the stuff to make the nerve agent – the problem is staying alive when making it (its erm….. dangerous – the guy who invented it died when his protective gear malfunctioned – he was killed by the stuff he invented – rememebr – this was a guy that supposedly knew what he was doing). Russia could have made the stuff, so could any other country with a functioning chem/ferti industry (finding somebody to make the stuff is another matter – hands up who has a death wish?). The UK’s Porton Down have said, categorically, that there are no “chemical finger prints” pointing to Russia. Motives for Russia killing the guy are unclear – given that they had plenty of opportunity when he was in a Russian jail. This suggests that something changed between when he was exchanged and now. It is probable that the Brits know what changed – but arn’t saying. What is know is that Johnson the UK’s Foreign Minister is & has always been a congenital liar. Which does not help an already confused situation. The Russian could be telling the truth – they did not do it & perhaps they don’t know who did. As Mr Corbyn noted – the best approach given all this is caution – a bit less finger pointing would be helpful. Non-UK readers should keep in mind that the Tory party is facing a wipe out in local elections due in May. The current “incident” and the poses being struck by members of the Tory government are connected to this piece of electoral reality. Other EU countries would be well advised to ensure that there is very clear water between them and a deeply dysfunctional tory government and its leader Mrs Maybot. As a man on the street, all I can see the UK with its allies slamming the Russians and the Russians slamming back. This looks like the coming back of the cold war, the good is the West, baddies are the Russians. The man on the street obviously does not have access to what is going on behind the scene. Is the public supposed to simply what comes out of government? The investigation is going on. Shouldn’t the accusations and defence come only when the investigation is completed. By slamming one another now raises questions of the integrity of the UK and its allies. It does not do it any support. If the Cold War has ended, it seems not then we should have honest, transparent, evidence-based behaviour. We cannot continue with the behaviour of we and them, of always having an enemy out there to defend, to unite. Is this also a tactic to distract from Brexit and its negotiations?